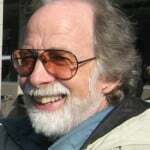 Lenny Anderson, 67, dropped out of a Ph.D program in the 1970s to work as a folk singer and printing press operator. 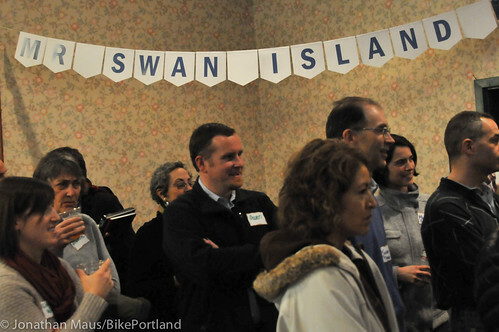 He later co-founded two newspapers, including a defunct print quarterly for TriMet riders, before carving out a job for himself as the one-man Swan Island Transportation Management Association. 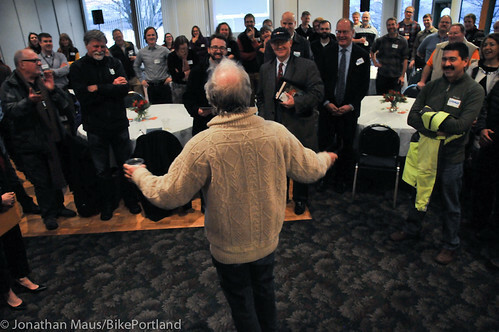 In that role he become a tireless advocate for encouraging Swan Island’s 10,000 employees to get to work by bike, bus, or shuttle — anything other than in their cars. Commissioner Novick (R) and his chief of staff Chris Warner. To commemorate the creation of that line, an effort that got Anderson the nickname “number 85”, McFarlane presented him with a metal “85” bus stop flag. 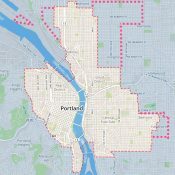 And in fulfilling a dream for the lifelong activist, Commissioner Novick presented Anderson with a seat on the Portland Streetcar Citizens Advisory Committee. 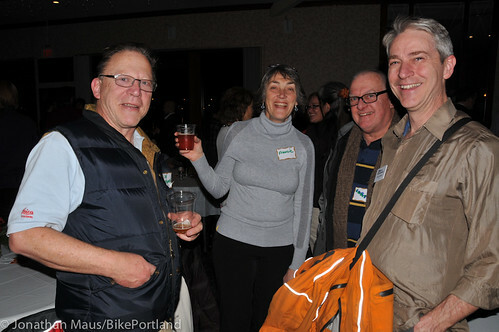 Scott Mizee, an architect who lives in the University Park neighborhood just above Swan Island, said Anderson and his co-conspirator Francie Royce drafted him into activism on behalf of the North Portland Greenway by taking him on a bike ride through the industrial area. 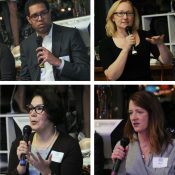 “He’s the first person that I met that said, ‘Hey, we need people like you who are interested in making a difference,'” Mizee said. Thanks to work from Anderson, Royce, Mizee and others, the long-planned Greenway passed several milestones this year and seems tantalizingly close to a deal that could close its biggest missing link: the Union Pacific rail yard just south of Swan Island. 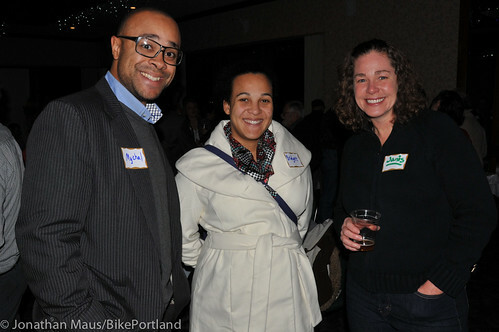 Community Cycling Center CEO Mychal Tetteh, his wife Bridget Johnson Tetteh and PBOT Transportation Options employee Janis McDonald. Joe Adamski, Francie Royce, and Timo Forsberg. (Sorry, I’m not sure who the man second from right is). 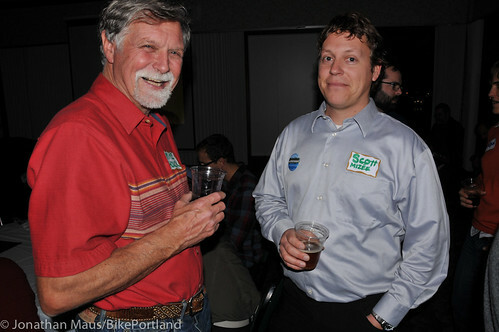 Urban naturalist Mike Houck and NPGreenway advocate Scott Mizee. 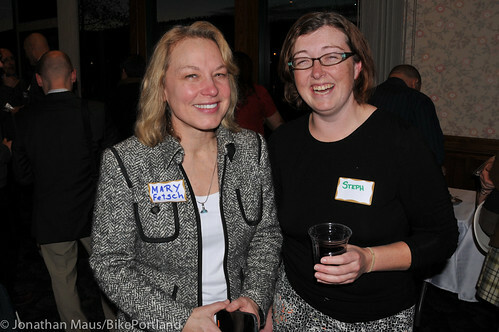 TriMet’s Mary Fetsch and former Oregon Walks director Steph Routh. 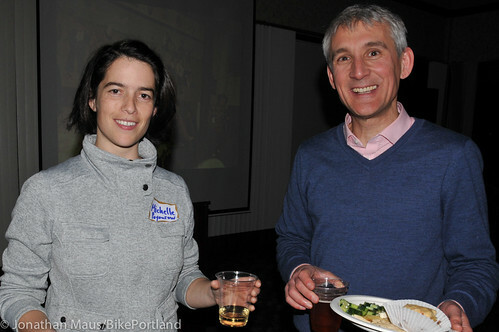 Transportation consultant Michelle Poyourow and PBOT staffer Steve Hoyt-McBeth. 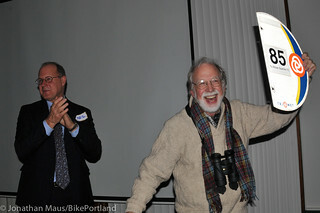 Anderson’s other key accomplishments include the new Waud Bluff trail connecting the industrial area to the St. Johns area, physical separation for a bike and walking path on Going Street, a loop of trail along the Willamette, and the Captain’s Walk, a sidewalk that opened last year on the site where a visiting ship’s captain had been killed by an auto collision. 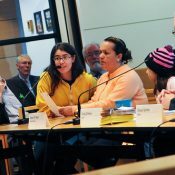 Anderson is also proud of being one of the first people to vote against the Columbia River Crossing highway expansion while sitting on an early task force for the project back in 2002. Steph Routh, the former director of Oregon Walks who, like Anderson, trained as a singer before becoming a transportation activist — and who, like Anderson, has sometimes been known to choke up during an emotional moment at a public event — said she admires how Anderson uses powerful emotions to add depth to his public policy arguments, just as his personal experiences had informed his folk songs. 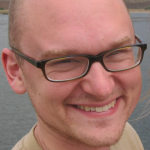 Publisher/editor Jonathan Maus contributed to this report. Correction 3:20 pm: An earlier version of this post incorrectly said Anderson was one of two people to vote against an early plan for the CRC. He cast the only “no” vote on that committee. Thanks Michael, Jonathan. Must be a slow news day! Was a great party! and a total surprise! 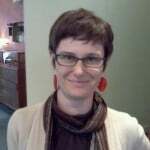 I sure hired the right person to take over the TMA…Sarah Angell, what an organizer! Right Todd, I ain’t dead yet…no bridges, etc. The Governors’ I-5 Task Force in June 2002 recommended, by a vote of 27 Yes, 1 No, the 10 lane bridge over the Columbia. I was the one NO. But more significantly, the TF split down the middle on a motion that spring to include an arterial bridge option in the DEIS (my motion, Mayor Katz 2nd). That vote was 9 Yes, 10 No, with Metro the deciding No vote! ODOT staff promised us that night that the “6-2-2” option as it was called would be included in the DEIS. It was not. So much for ODOT promises. Lenny, I was so sorry I couldn’t make it to your party…I was on a train back from Seattle. You have been such a force for good in our city. Thank you for your service! Best wishes! I am sorry I had a conflict that night and couldn’t make it. Best wishes. I am sure you will continue to be a productive trouble maker for your City and our Region. Sarah: Thank you for organizing such a great event. He’s a good singer. Amazing all the ‘insiders’ he seems to be chummy with. 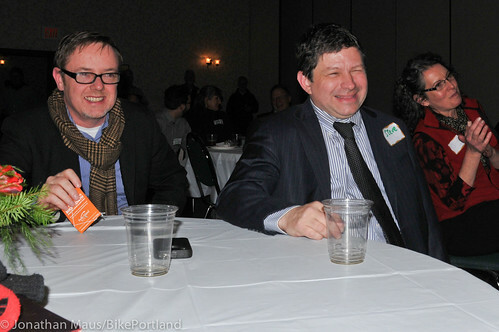 That (unidentified) handsome old duffer in the picture with me is Mr Curt Schneider, co-chair ( with Francie Royce) of npGreenway. Handsome and one of the nicest guys you’ll ever meet! Any way to see copies of the Trimet riders quarterly? I had a copy of the Transit Gazette for a while, but returned it to Lenny earlier this year. Ah. Okay, maybe one day we could get some in the library somehow. Thanks. Warmest wishes and regrets from me too! I’m thrilled that Swan Island TMA is in such good hands with Sarah, and hope your retirement means that we continue to benefit from your wisdom and activism, just in a different role. Thanks, Lenny, best wishes on your future endeavors. I think I have some more copies of the Transit Gazette which will turn up as I get my home office set up. Where should they be archived? PSU? or?